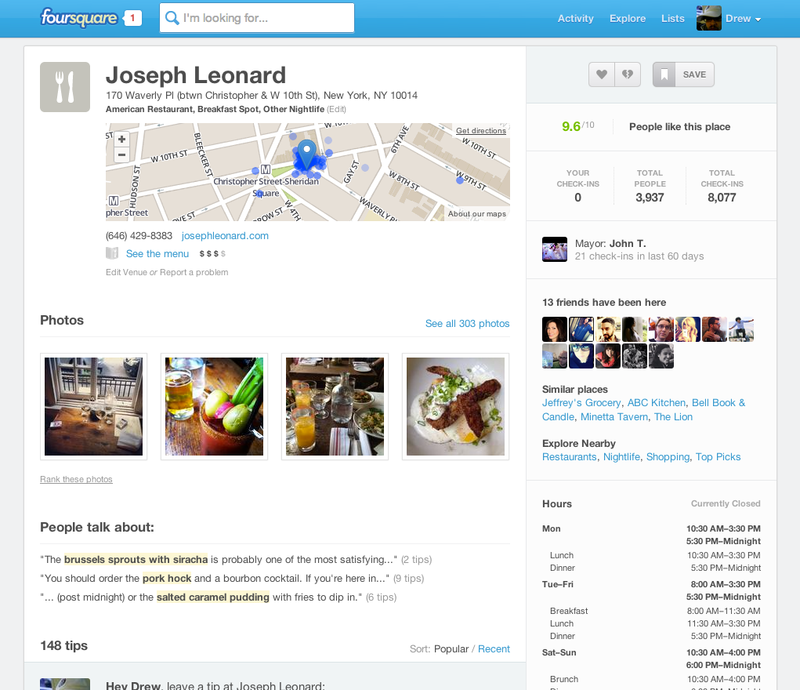 Foursquare today launched redesigned venue pages to focus on its Explore and Discover functionality, bringing them more in line with its homepage. The changes, which come two weeks after the company raised another round of funding and released an updated iOS app, are designed to capitalize on the traffic that Foursquare gets from Google, which has doubled the site’s traffic over the past year. 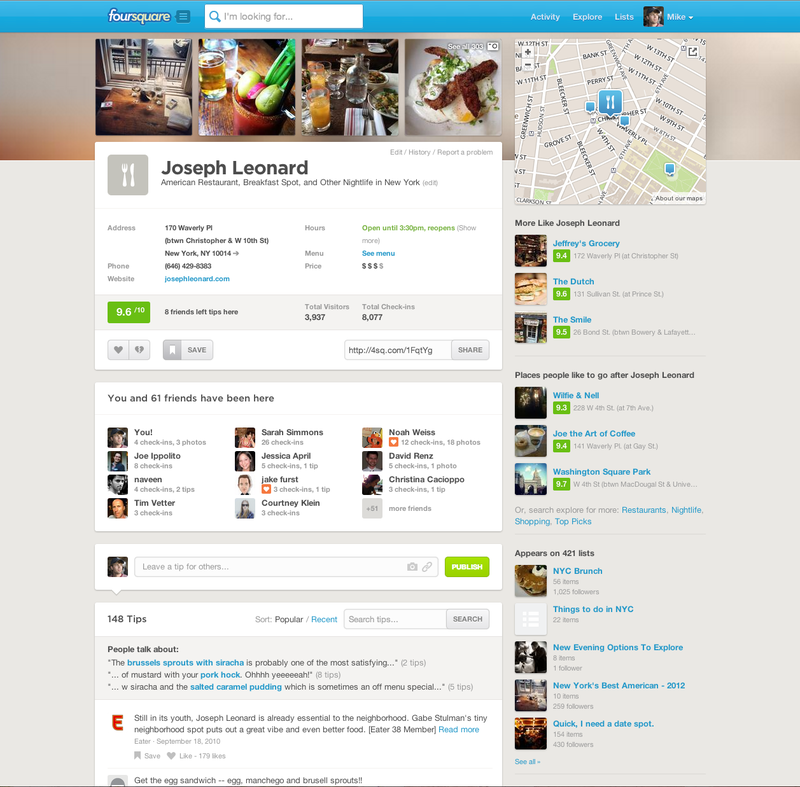 This is an important play for Foursquare, as it’s competing with Google Local, Yelp and Facebook, which today launched its redesign for local business pages. People are coming from Google for different reasons, we needed to give them the information they needed at a glance, which was difficult. Since focusing on its Explore functionality, Singleton says that its usage has doubled, especially on the website. The new venue page has all of the information that people need in a quick glance, the pages are more visually appealing, and owners of the venues should be proud to show them off, perhaps by linking to them on their website over competitors like Yelp. You’ll notice that some of the more attractive content, such as photos, are pushed way down, putting more focus on the map. Additionally, information such as when the venue is open was shoved to the right-hand side, requiring a scroll, as well as someone’s eyes actually finding them. This redesign solves that. The new design is cleaner, and brings all of the information that Google searchers would want to see immediately, such as photos of the venue and a more attractive map. Since some of the people visiting from the web might not be app users, Foursquare wants to give them a better first impression of the service by populating the page with the info that’s needed to make quick decisions, such as whether to actually go to a place for dinner or not. By being able to search through tips, you could find information about a particular meal, rather than continually clicking “next” buttons to scan all tips. Naturally, Foursquare wants this page to attract new users. Logging in tells you which of your friends have visited the venue you’re looking at, so that part of the page has been given a special treatment as well. Foursquare is now also recommending places to go to after you’ve visited, such as a nearby park or a place to have a nightcap. This is another example of the company leveraging every bit of information that it has captured since its launch. By freshening up its looks on the web, Foursquare is hoping to grab more traffic and become a true destination for information about places close to you, whether you ever actually download the app and check in or not. If Foursquare can turn its 50 million monthly visitors into more app users, then the cycle of generating more useful data will continue. That’s an if, but these pages are a huge upgrade and beg to be interacted with. Are web-based ads on the horizon? 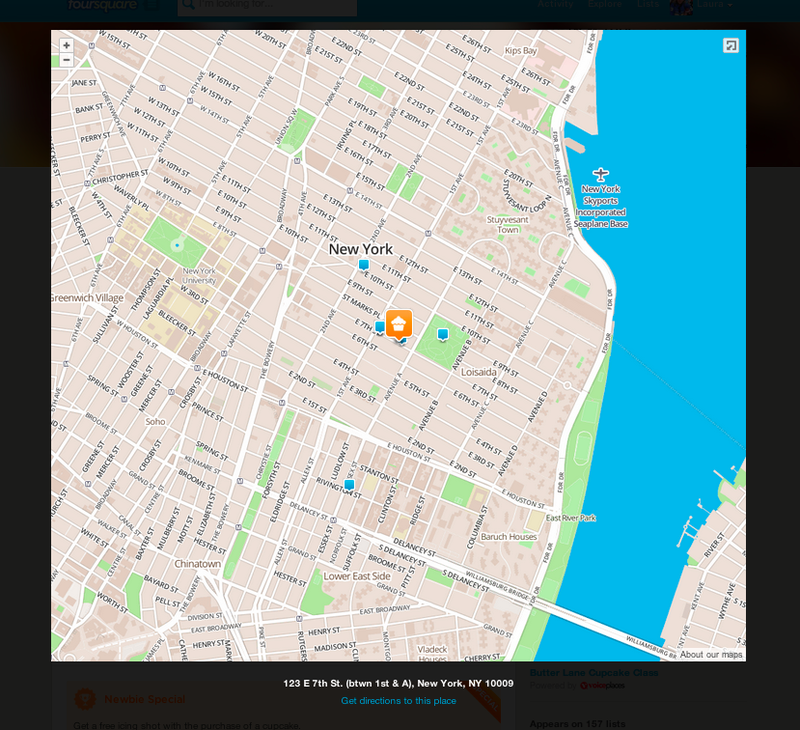 Foursquare certainly has enough data to start serving them on their own, and others’, sites.